Pizza is one of my absolute favorite foods. With a wide variety of topping combinations, it is definitely a food that I will never get bored eating. I also love that I can make it good-for-me by simply building a better pizza. Pizza is one of my absolute favorite foods. With a wide variety of topping combinations, it is definitely a food that I will never get bored eating. I also love that I can make it good-for-me by simply building a better pizza. 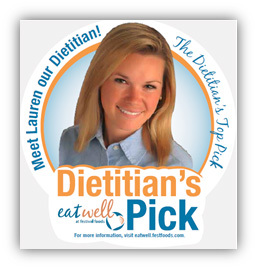 Check out the video below to watch me and fellow Festival Dietitian, Stephanie, in pizza-making action! 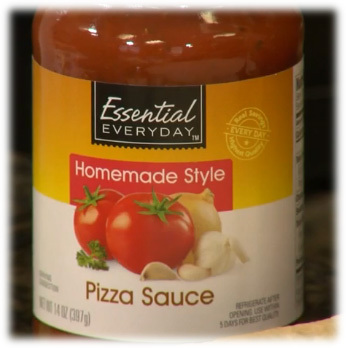 When it comes to my pizza sauce of choice, I always reach for Essential Everyday® Homemade Style Pizza Sauce. Minimal in saturated fat, sodium and sugar, this savory sauce is sure to make your pizza pizazz! Nutritional Information for ¼ cup: Calories 30 Total Fat 1.5g (Saturated Fat 0g, Trans Fat 0g) Cholesterol 0mg Sodium 250mg Total Carbohydrate 4g (Dietary Fiber 1g, Sugars 12) Protein 1g Vitamin A 6% Vitamin C 0% Calcium 0% Iron 2% Ingredients: Tomato Puree (Water, Tomato Paste, Citric Acid), Soybean Oil, Salt, Spices, Dried Garlic, Dried Onion. Disclaimer: We strongly encourage guests to review the ingredient lists of suggested products before purchasing to ensure they meet individual dietary needs. All products not available at all Festival Foods locations.